16" x 22"Cherrywood or Blackwood frame holds any 8" x 10" photo and tassel. Burgundy or Black mat with gold foil inner mat. Made in the USA. Customized with graduate's name, school and date. Beautiful 8 1/2" x 11" Blackwood or Cherrywood frame holds any 5" x 7" photo & tassel. Black or Burgundy mat with gold foil inner mat. Made in the USA. Customized with graduate's name, school and commencement date. Easel back for standing on desk or table. 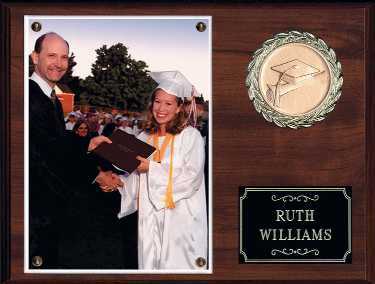 Holds any 5"x7" photo, Customized with graduate's name and school. Fits in standard 8"x10" frame for wall hanging. Elegant mahogany finished beveled wood plaque. Displays your 5"x 7" graduation photo (print included). Photograph mounted and protected by clear Lucite. Beautifully engraved with your name. at home or the office. Custom sizes to fit your diploma. To order these products alone products link. Questions go to customerservice@cvstudios.com or call 877-446-2196 Thanks.